Cannot be Special Summoned. If you Tribute Summon this card, the Tributes must be DARK. Cannot be Tributed by a card effects while face-up on the field. Once per turn, during your opponent’s Draw Phase, before their draw: Look at the top card of your opponent’s Deck, and if you do, place that card on either the top or bottom of their Deck. Diabolos, King of the Abyss is such an awesome-looking card, but not a card that is easily playable. No Special Summoning at any time really hurts this card. Tributes having to be DARK restricts this card to one Attribute, but its probably the best Attribute in the game, breaking even here if not coming out on top with so many DARK decks that spam the field. Protection against tribute effects while face-up on the field prevents some cards from taking out Diabolos, better protection would’ve been preferred though. The ability to adjust your opponents draw is a great effect, and was unheard of aside from Time Seal back in the day. You choose top or bottom. If top, you know what’s coming, if bottom, a mystery. This can be a great effect to dodge that dreaded topdeck that will kill everything you’ve worked for, but for a monster that has so many hoops to jump through, it seems lacking. Better protection and the ability to Special Summon after it had first been Tribute Summoned would’ve made this card a legit monster. I like it, but it isn’t meta worthy, especially after its upgrade in the Lair of Darkness Structure Deck. I’m going to borrow one of my old reviews and apply it here. Diabolos, King of the Abyss is no good. It’s more searchable than ever, but the effect doesn’t do enough, the protection isn’t good enough, and the restrictions are too high. Don’t run. We got a new Diabolos, but it will be interesting to review the original version: Diabolos, King of the Abyss. Also, you will notice that this is a boss monster of an old Structure Deck very soon. Diabolos here is a Level 7 DARK Dragon with 2800 ATK and 1000 DEF. Stats are acceptable and allow you to work with some Monarch cards if you desire. Level 7 is a fine Level, normally would be on a Dragon if it wasn’t for a setback that prevents you from using Return of the Dragon Lords, but still a good type. DARK is a great attribute as well. The original Diabolos cannot be Special Summoned, and that was very common on these old Structure Deck boss monsters. It wasn’t really necessary though since these old boss monsters usually were not overpowered. Another setback this has is that you must tribute DARK monsters to summon this guy, which is really unnecessary after you prevent this from being able to be Special Summoned. 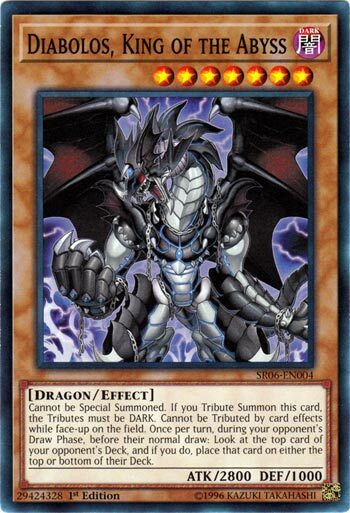 Diabolos cannot be used for a tribute off a card effect, which is not great protection in 2007 and weaker in 2018 since Kaijus are still an option. Now here is the effect for why they put these drawbacks on this card. Before your opponents Draw Phase and before they draw their card for the turn, you can look at the top card of their deck and either place it on the top or bottom of the opponent’s deck. Ok, that is a solid effect but this is hard to summon still and Tribute Summoning is not optimal in 2018 anymore really. I don’t know if this needed the drawbacks back then considering this wasn’t really searchable back when it was released except by Witch of the Black Forest, which was Forbidden I believe. I feel they could of removed one of those drawbacks and this would of been a solid card, but the difficulty there is to summon this just makes you want to just run the new Darkest Diabolos. Art: 4/5 I like the artwork though. Dragons can have some pretty sick artwork. This isn’t the new Diabolos…and it’s not Thursday…my world is unraveling, what is going on here? Dragon, Dark, these are good, Level 7, not as good, we want Level 8…2800 attack is great though (1000 defense not so great). Mandates Dark Tributes, can’t be Tributed by a card effect while face-up (that probably isn’t too relevant in either variation there, but it’s still a protection of sorts). Getting to see an opponent’s card BEFORE they Draw it is rather unique. The fact the card can be put on the bottom of their Deck too, is rather kickass. But the fact is, this guy doesn’t protect himself enough, and he doesn’t do enough.